This library reads/writes Atmel AT25DF-compatible SPI DataFlash ICs (ex. Spansion S25FL) through either a SW or HW SPI interface. The sample serves also as Firmware for the DataFlash Programmer application to write data to the memory. It uploads a list of any type of files, image files are converted on the fly to the uncompressed 16-Bit color BIN format. To access the stored information, an include file with all the neccessary constants (memory position, size, image width & height) is generated. The library has been developed and tested using an XMega-A1 Xplained board with a Spansion S25FL032P (32Mbit) dataflash mounted on it. Include the library. Set the options above the $include statement, needs the new Submode. Erase a sector (64Kb block, upper 8 Bit of 24 Bit byte adress). The memory has to be erased (set to &HFF) before writing data. Writes a page to the memory (256 Bytes) to a specified page adress (upper 16 Bit of 24 Bit byte adress). Start an asynchronous read sequence. 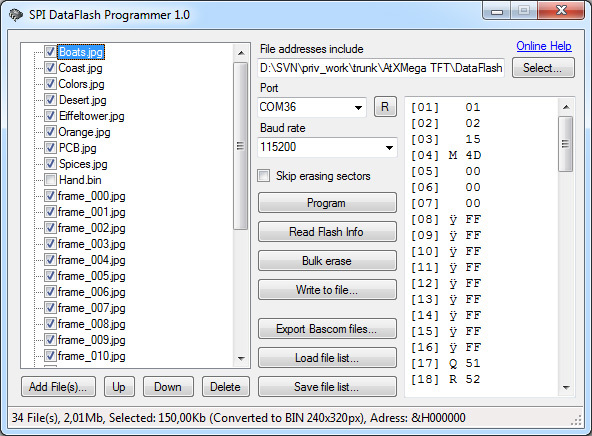 Data can be read byte-wise from the 24 Bit start adress until Flash_endread() is called. Options and settings need to be set before the $include-statement, every setting has a default value that will be used if not specified otherwise. (in the list below the default values for the ATXMega are shown, values for ATMega are written in brackets () if applicable). Set to true to use software SPI instead of hardware modules, any GPIOs will work. 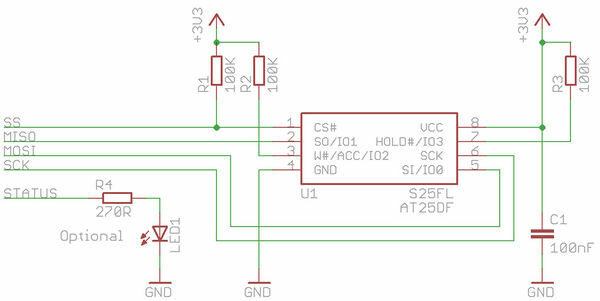 False only configures the SS pin, does not enable and configure the SPI interface, this needs to be done manually (useful if the memory shares the SPI interface with other hardware). Sets the port of the SPI interface. Enable the status LED. Active during ongoing transmissions. Only a handful small components are needed to connect the memory. The status LED is optional. This sample also serves as firmware to program the memory with the DataFlash Programmer application, works for both ATMega and ATXmega devices. The SPI DataFlash Programmer application allows in-circuit programming of the memory over a serial connection. It uploads any types of files, images files (BMP, JPG, PNG, TIFF) can be converted to the uncompressed 16 Bit color BIN format on the fly when writing the data (standard). To use this application, the sample from above has to be programmed in the microcontroller, set up the SPI and the USART interface correctly. On the left side, choose the files to upload, rearrange them as you need and choose whether to convert image files to BIN by checking the box (initially checked for images) or upload them as they are by unchecking (does not affect other file types). Select the correct port and baudrate for the communication to the device, the "R" button refreshes the available serial port list. During the programming process, the File addresses include file is written, which contains information about the stored files (start address, size, width & height for images) as constants. Because page writes can't change 0's to 1's, the memory needs to be erased (sets everything to 1) before writing data to it. Erasing is done sector-wise, which are 64Kb blocks. This is done automatically during programming process for each sector containing pages to write. You can skip this sector-erasing by ticking the checkbox, only page writes are executed. Bulk erase could be used instead, this erases the whole memory at once (takes a while). If the DataFlash device supports the JEDEC RDID command (likely), "Read Flash Info" displays these informations. "Write to file..." writes the resulting data stream into a binary file instead of programming a memory. At least, a file list in .txt format (one file path per line), containing the files to write, can be saved or loaded. Diese Seite wurde zuletzt am 31. August 2017 um 03:18 Uhr bearbeitet.